It happens all the time. Clients come to me reciting impressions, page views, the number of unique visitors, email opens vs. industry standard, likes, shares and time spent on any landing page and don’t quite understand why everything isn’t adding up to revenue. There seems to be the same disconnect for their large email lists that aren’t leading to new sales. They think they have a marketing problem when in fact it is a perspective problem. The misalignment between their strategy and what they measure is caused by not thinking from the perspective of a potential customer. 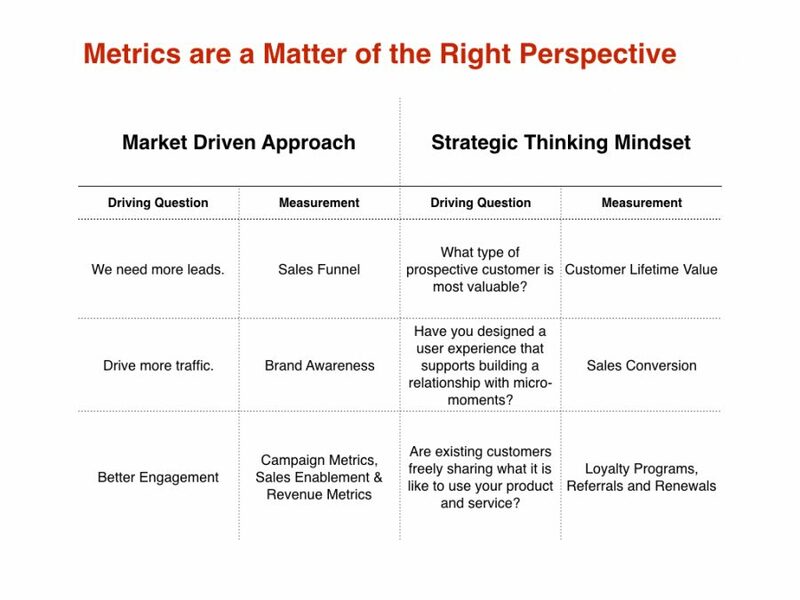 In our data-obsessed marketing culture, the measurement mindset leads to marketing spend and success metrics that lose sight of the longer strategic initiatives. To align metrics to strategy requires a fundamental shift in what and who you care about. The critical metrics are those that measure meaningful micro-moments across the relationship between the brand and its potential and existing customers. Do you consider what your customers say about you more important than what industry analysts say? Do you care more if customers buy your product or never actually use it? Do you pay attention to how the customers interact with your brand story? Do you think about what users see before they even know they need you? A longer-term perspective that focuses on the customer experience allows brands to think more broadly about success and progress towards strategic goals that measure their relevance to customers’ lives.